Friday, October 20, 2017 7:00 PM Kent Roosevelt High School AWAY 9 Barberton High School HOME 49 Game Recap The Rough Riders lose to a solid Barberton team on Friday. Josh Montanari was 3/3 on field goal kicks for the Riders. 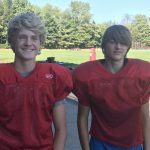 Saturday, October 21, 2017 10:00 AM Kent Roosevelt High School AWAY 21 Barberton High School HOME 38 Game Recap The Rough Riders take a tough loss in the last game of the JV season. Tyrell Fields had an interception for the Riders and Tyler Heritage scored a touchdown for the Riders. Thursday, October 19, 2017 4:30 PM Kent Roosevelt High School AWAY 0 Barberton High School HOME 16 Game Recap The Rough Riders lose a close one to the Magics on Thursday. Thanks to Panini’s Kent for sponsoring our players of the week: SO Tyler Heritage and JR Brandon Wagner. Please join them at Panini’s this week. 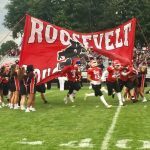 Saturday, October 14, 2017 10:00 AM Kent Roosevelt High School AWAY 38 Crestview HS HOME 0 Game Recap The Rough Riders take home a nice win after a long bus trip on Saturday. Tyrell Fields, Cade McDougal, and Luke Larkin all had touchdowns for the Rough Riders. 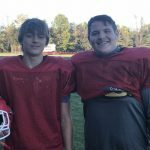 Friday, October 13, 2017 7:00 PM vs Crestview HS AWAY 35 Kent Roosevelt High School HOME 18 Game Recap The Rough Riders take a tough loss to Columbiana Crestview on Friday. Thursday, October 12, 2017 5:00 PM vs Riverside AWAY 40 Kent Roosevelt High School HOME 8 Game Recap The Rough Riders take a tough loss to Riverside on Thursday.